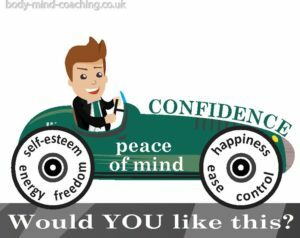 Overcoming overwhelm, can you live with ease? Is stress what you think? Last month’s mental health awareness week, mentioned stress as being a key factor. You can take their stress test below my take on it. And for people who really want to get a better work life balance, a good sleep and deal with their feeling of overwhelm, I run 20 steps to beat stress workshops. Is stress what you think? Most people think stress is normal. Yes, it has become part of life and seems the norm. But does this make it normal? And, even if stress is the norm – is that a reason to make it normal? Yet, the word stress is now more often used to describe a chronic situation where we feel we are under pressure and struggling to manage. What you think stress it is? How to get more energy often through more exercise? More rational: but you can’t rationalise a feeling? More information: we are surrounded by more information than ever before and seem more stressed not less? The problem with all of the above is that they are about force and effort. And that creates more stress. If you had more time you’d only find more things to fill it. If you had more information you’d feel stressed about having time to process it. And so it goes on because the solutions offered tackle the symptoms, not the cause. Whether it’s in our businesses or our relationships – we are all, or most of us, guilty of practising this exercise in futility. We get on that old hamster wheel and get stressed and frustrated that nothing has changed. This is what I saw in my clients and is the type of question I asked myself after some years working as a therapist. In 1993 when I started my practice, RSI stood for Repetitive Strain Injury. RSI, as described on the NHS website, ‘is a general term used to describe the pain felt in muscles, nerves and tendons caused by repetitive movement and overuse. It’s also known as work-related upper limb disorder, or non-specific upper limb pain. By 2016, I found that the symptoms clients were experiencing were much the same but now I had decided to call it Repetitive Stress Injury. A link exists between most RSIs and the stress of repetitive motions at the computer or overuse injuries in sports. … An RSI occurs when a joint experience stress that pulls on the tendons and muscles surrounding it. If the stress is repeated the body does not have time to recover and becomes irritated. And the same is true of the brain. SO, despite knowing all that, why is stress so prevalent? For me it means that what we think is the cause of stress can’t be the problem – otherwise solutions advocated for years would have worked by now. And we would be seeing less stress in the world, not more. Can we live with ease – not dis-ease? I think of peace as the opposite to stress. So if stress not what you think, then how you get rid of it also has to change. To do that you need to understand your stress. Here’s a few pointers for you to consider when getting to grips with stress as it is for you. How committed are you to dealing with your stress level? Scale it from 0 to 10. If you are not at an 8 or above then this is not surprising nothing has changed. If I had a magic wand and could change one thing about you what would it be? Would that affect your stress levels? If not then again you are looking in the wrong place to resolve your problems. Who are the FIVE most important people in your life? Are you on that list? If not – why not? Looking after yourself is not selfish. If you are on a plane that’s about to make a forced landing you put your own oxygen mask on first. If you can’t breathe then you can’t help anyone else. There’s an important difference between self-interest and selfishness as this blog from Pink&Green explains. If something is stopping you from acting in your own self-interest what is it? What is this thing we call stress? Think about going on a roller-coaster. It can be a fun and exhilarating thing for some or it can be frightening or stressful to others. The things that happen in our life are just the same. Our response to what is happening! It is a feeling of lack of control and a belief that if we aren’t in control we’re not secure. That insecurity is the point at which we tend to freeze. The point when our head and heart/our body and mind, no longer speak the same language. That is the true thing we find frightening, not the event. How did we get there and how did it happen? Disconnected from feelings. Often raised to hide them we learn to see feelings as a bad thing. Become a human doing rather than a human being. We’re always on the go because if we stop we might start feeling guilty. Or we might simply start feeling and then lots of pain and sadness could surface. Things we would rather not look at. If it is not outside, then is it inside? If more isn’t working how might less be? How does it feel to say no to something so you can say yes to you? Who can think more than one thought at a time? Einstein once more: Life is like a bicycle to keep your balance you must keep moving. So, if you can only think one thought at a time and you have time to breathe, to get out of from the frozen state (not moving state of stress) you can simply start to focus on the movement of your breath. Count in for four – then hold for four counts, then breathe out for four counts and hold your breath for four counts before starting again. This is square breathing. I tend to close my eyes and count: in, 2, 3, 4 hold, 2, 3, 4 out, 2, 3, 4, hold, 2, 3, 4 etc. The pauses are the time when your thoughts will begin to still. They are the most important part of the breath and are key in life, if we only allow ourselves the time to pause in our activities. Having done this a few times notice how you feel. Now go back to the understanding stress question: What is your stress level? Scale it from 0 to 10 and notice if the number is any lower. It’s important you consider how you want to feel and describe it in a way other than I don’t want stress or I don’t want pain, tension etc. The language you use to describe it needs to reflect the positive change that has happened once the things you don’t want have disappeared. Language makes a big difference (but that is for another blog). Do you not want to feel like this? Or do you want to feel like this? Give yourself the gift of prioritising yourself and having joy in your life. Say yes to less – by which I mean it’s OK to say ‘No’ and you don’t have to feel guilty. Remember: Stress is not what you think, it is WHAT you think! 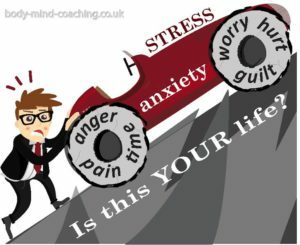 If you would you like more help, get in touch for a one-to-one free taster session or check out my workshop – 20 Steps to Beat Stress. Here is an animation with more details about stress and you can take their stress test. ← Feel stuck? Get the spring back in your step!